Here’s the thing–The Addams Family is old. By kid’s standards, really old. After being created by cartoonist Charles Addams in 1938, they decided to air the television series about the ghoulish family in 1964. The premise of the show is mostly that some weird family living in a mansion consistently creeps out the neighbors with their non-traditional love of all things macabre, as well as some supernatural abilities that are never fully explained. This was successful enough to warrant the creation of an Addams Family movie in 1991–which was in turn popular enough to warrant a sequel in 1993. Some years later it was turned into a musical comedy and opened on Broadway in 2010. 3-D Theatricals current production of the show is cast absolutely perfectly, but the play itself is the problem. It is built too heavily on the history of the Addams Family, and history does not entertain entire families. With a story so heavily geared towards people who are already fans, can this really qualify as a successful family show? After seeing it Saturday night, I can’t help but say: not really. 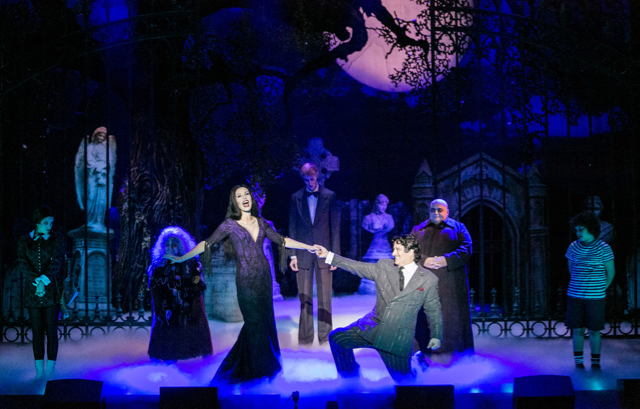 The Addams Family mainly consists of family patriarch Gomez ( Bronson Pinchot) , his luscious wife Morticia (Rachel York) , Uncle Fester( Anthony Gruppuso), Grandmama(Candi Milo), their Frankeinstein-esque butler Lurch(Dustin Ceithamer), daughter Wednesday(Micaela Martinez), and son Pugsley (Dante Marenco) (brief appearances of other known characters occur throughout the musical). The musical takes place some years after Wednesday Addams has grown into a young woman. Our hilariously stoic Wednesday Addams has grown up and fallen in love– with a boy from Ohio nonetheless. 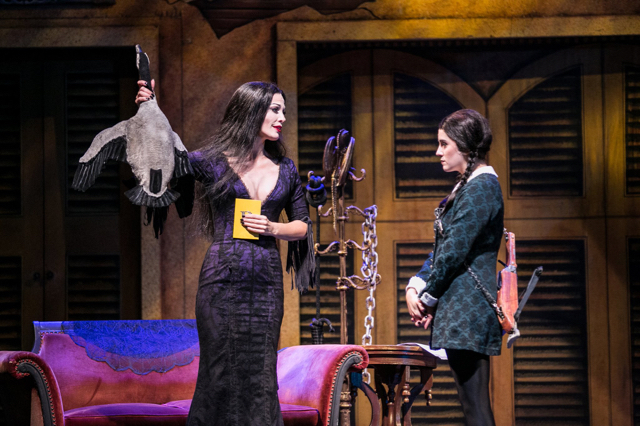 His parents are coming to the Addams Family home for dinner and both Wednesday and her new beau are anxious about how their respective families will receive one another. Tension between Gomez and Morticia rises when Wednesday entrusts Gomez with a certain secret. Annnd…that’s it. That is the plot. That is the source of all of our drama. Will Gomez and Morticia break up? Obviously not. Will Wednesday and her charming sweetie from Ohio end up together? Possibly, but it doesn’t really matter. Since the plot is considerably weak the actors must rely on humor to keep us entertained. To a certain extent they actually succeed. I said it above and I’ll say it again, the casting for this show is absolutely flawless. Every actor is funny in their own right, the lines are delivered to us perfectly. But a good portion of the jokes are meant to be seen and heard by people who grew up with the tv series/films. If you fit into that category then the chances of you enjoying the musical exponentially increase. If however you are a child or someone experiencing the Addams Family for the first time, you might have some trouble getting into it. The singing is all excellent but the music is not. I can think of two or three songs that are enjoyable just because they sound good, the rest have an appeal rooted either in jokes or elaborate dance numbers. Speaking of dance numbers, special mention of the night goes to the entire ensemble cast of ghostly relatives, they are all unspeakably skilled. It is important to get a seat near the front to see all this action though. The heart put into this production is real. The actors are phenomenal, the singing is great, the set looks fantastic. Neither the storyline nor the music are tremendously strong but the humor helps carry it through. Absolutely recommended to fans, younger members of the audience may get restless if they are not familiar with this particular family. Thanks — well written review, as yours always are.